We spent the night in Ghanzi – a small town in the middle of the Kalahari Desert. 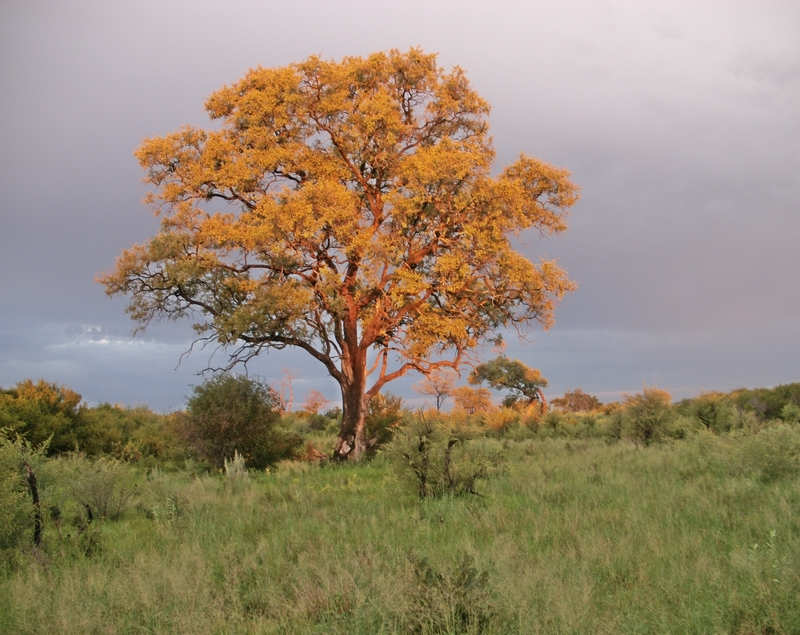 Known as the “capital of the Kalahari” Ghanzi has cattle farms and a “conglomeration of ethnic groups”. 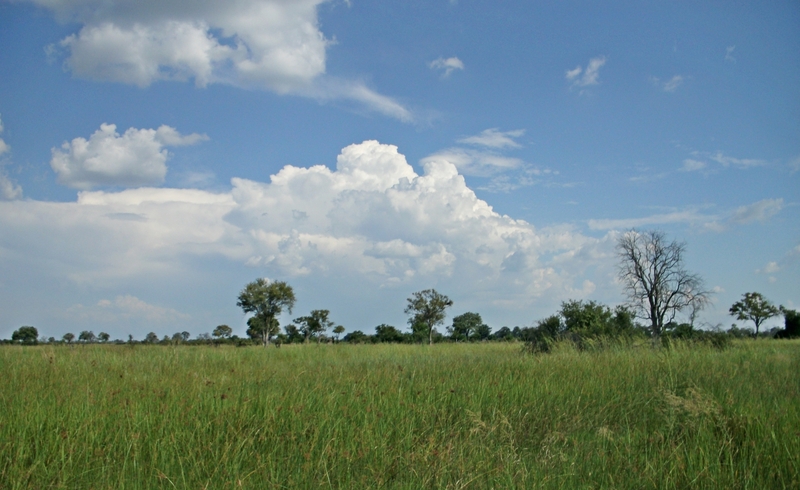 The San and Bakgalagadi were Ghanzi’s original inhabitants. In the late 1800s, the Herero, Batawana, and others settled in the area. 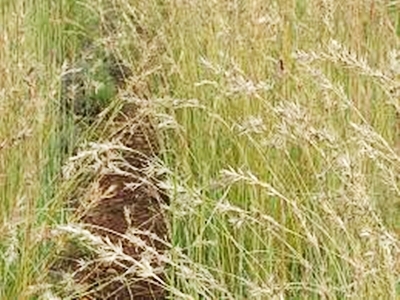 Ghanzi villagers maintain an abundance of cattle, donkeys, and sheep – all affected by serious drought over the past several years. 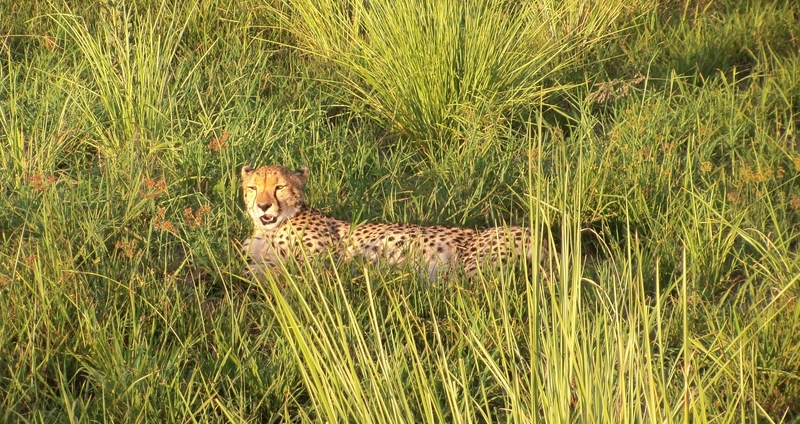 Animals graze along the roadside and even on the roads! Driving in the area is tricky with the government imposing a severe punishment for injuring animals. Botswana is socially conscious and invests substantially in the education and healthcare of its people. The country doesn’t have the racial issues of many other African countries. 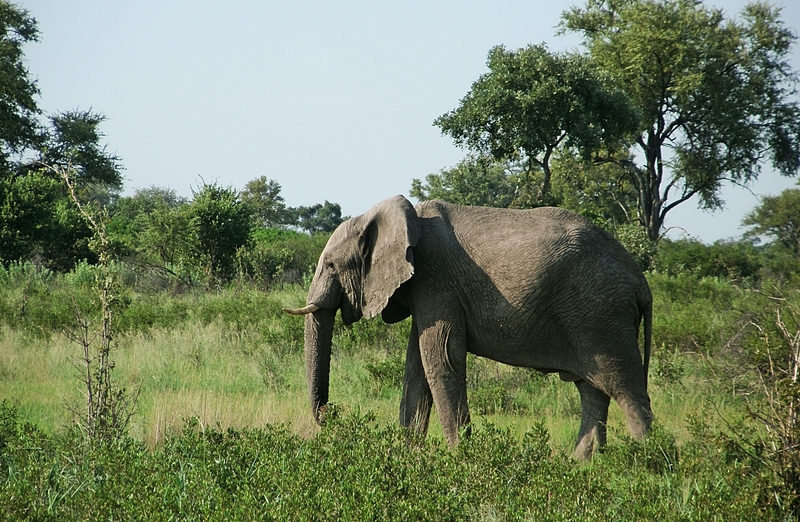 The Botswana government uses a form of ecotourism – “high income and low impact tourism”. Botswana charges more for services than adjacent African countries, prohibiting some travelers from visiting, and thereby reducing the number of tourists entering the country. Luxury safari camps are common but comfortable, more basic mid-range accommodations are also available. Botswana won independence from Britain in 1966. Today it’s a politically stable country with one of the strongest economies in sub-Saharan Africa. Botswana’s diamond mines are the richest and most abundant in the world and the highest producing. The mines exist on volcanic kimberlite pipes composed of a rare type of rock formed millions of years ago. During volcanic eruptions plumes of magma pushed up tearing off chunks of diamond-containing rocks depositing them near the earth’s surface. During our first evening in Botswana, we enjoyed a special treat – traditional tribal dancing performed by the local San community. Previously known as “Bushmen”, the mellow San are indigenous to Southern Africa. 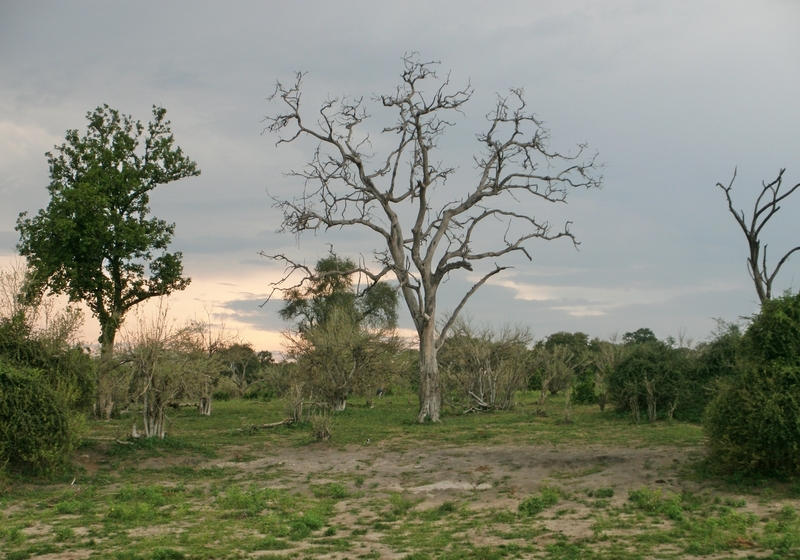 The San have lived in Botswana for over 30,000 years and survive in the harsh desert environment by living “peacefully in harmony with nature”. 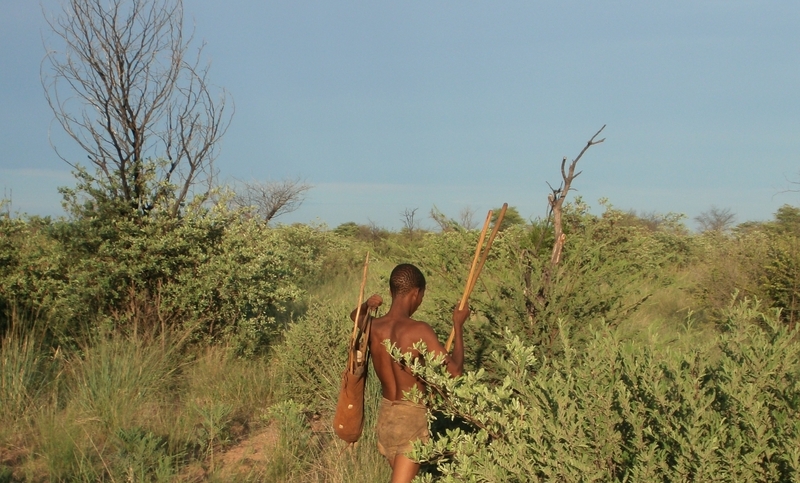 After arriving in Ghanzi, San Bushmen took us hiking in the Kalahari Desert. They shared ancient survival methods and secrets about how insects, animals, and humans can live in the desert. Later they danced for us by campfire in the moonlight! 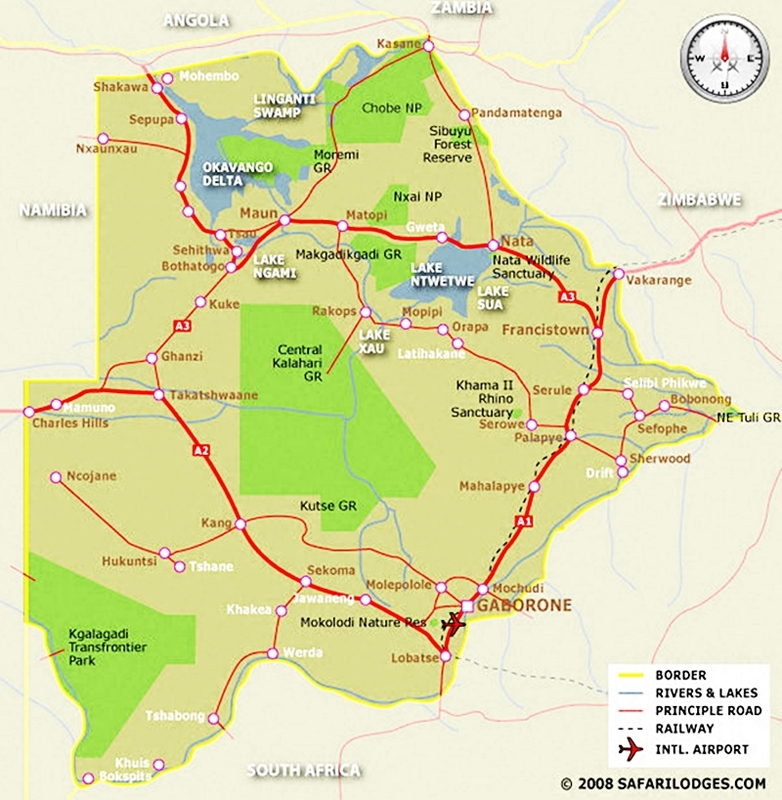 The next morning we headed for Maun – the third largest city in Botswana. 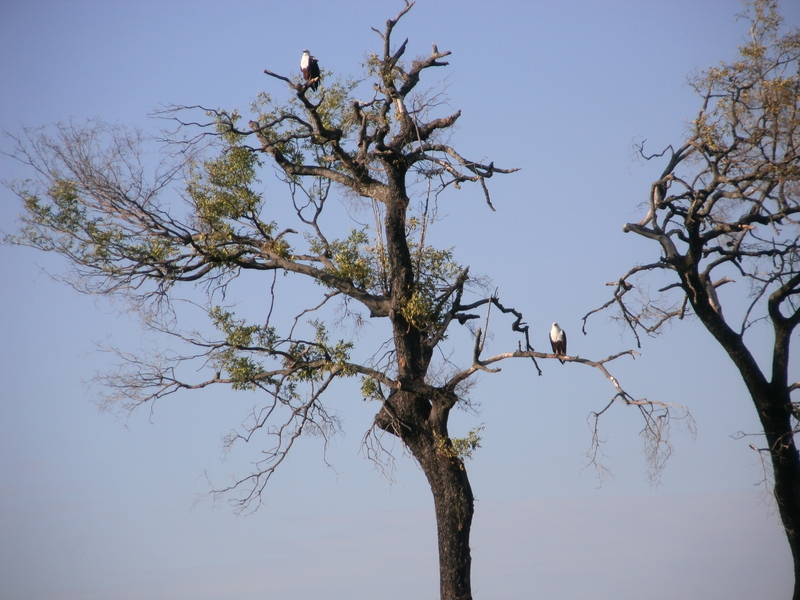 Maun is known as the gateway to the Okavango Delta. The name comes from the San word “maung”, which translates “the place of short reeds”. After an overnight in Maun we boarded small airplanes and flew low over the Delta to our secluded safari camp – home for the next two days. To comply with luggage safety restrictions in the small airplanes we packed lightly leaving most of our electronics and valuables back in Maun locked inside the safari truck. Our guides stayed behind and waited for us. 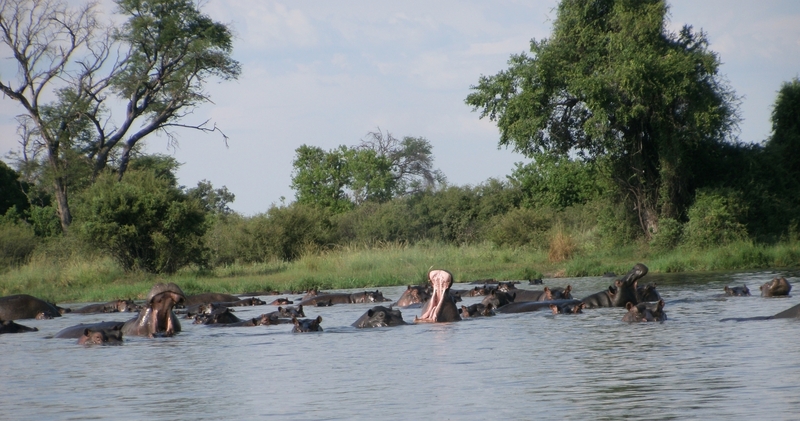 The Okavango Delta and it’s one of the world’s best locations for game viewing. Hundreds of bird species and massive numbers of large mammals live in the Delta where prey and predators are forced together in the floodplains. Lion, elephant, hyena, buffalo, hippo, and crocodile gather with antelope and smaller animals like warthog, mongoose, baboon, and bush baby. The Delta is also home to the endangered African Wild Dog with one of the richest pack densities in Africa. Many animals pass through the Delta during summer migration. When the countryside dries up in winter, they cross again on their way home. 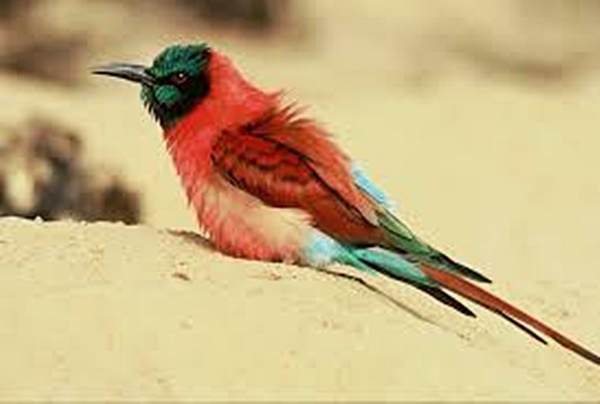 Brilliantly colored Carmine Bee Eaters welcomed us by following the safari vehicle. Much to our delight, they flew low and close to the jeep “buzzing” us on both sides! 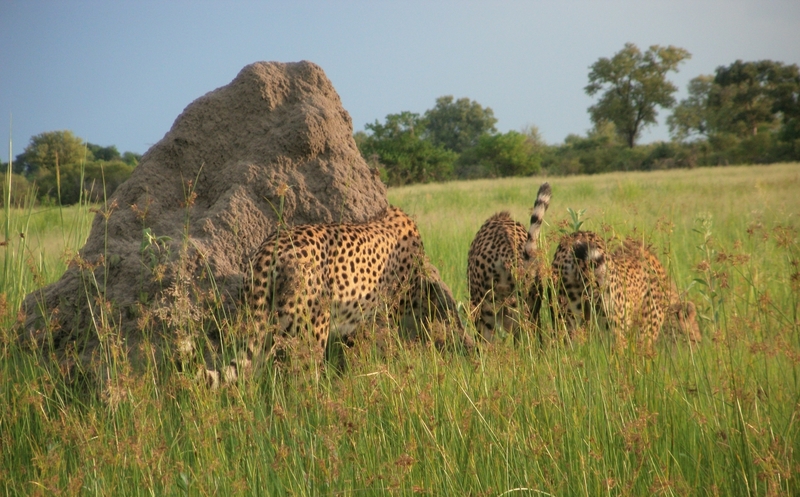 After lunch at our safari camp – Fallen Baobab – we took a game drive and nature walk with a local expert. 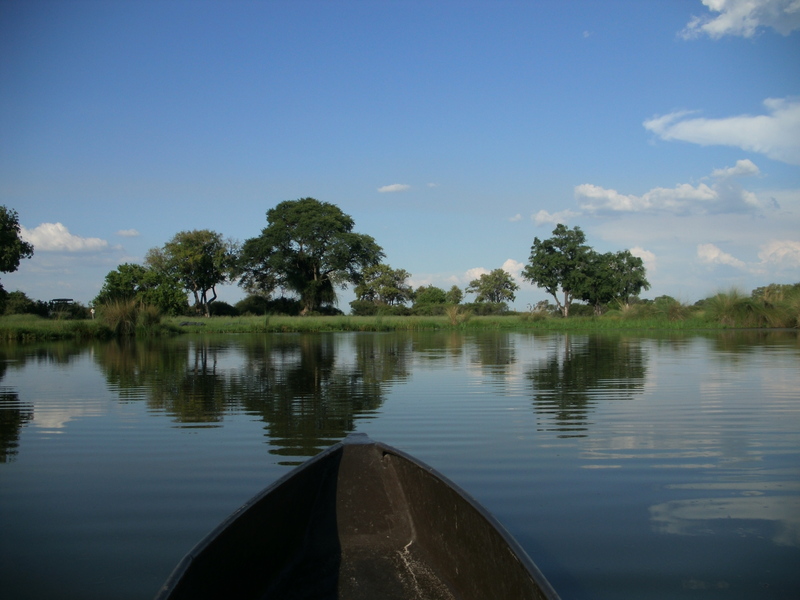 Later we took a boat trip in traditional dug-out canoes – Mekoros. 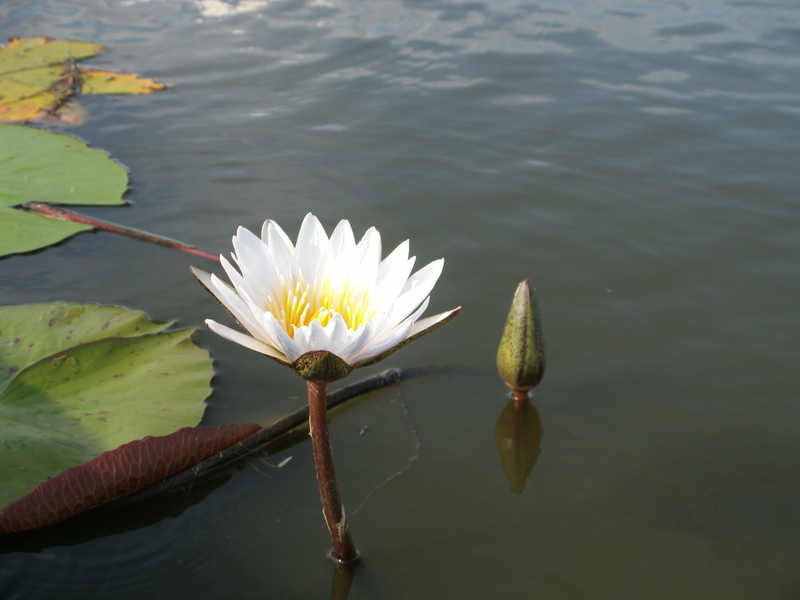 Skillful African polers navigated through narrow fragrant waterways strewn with waterlilies. 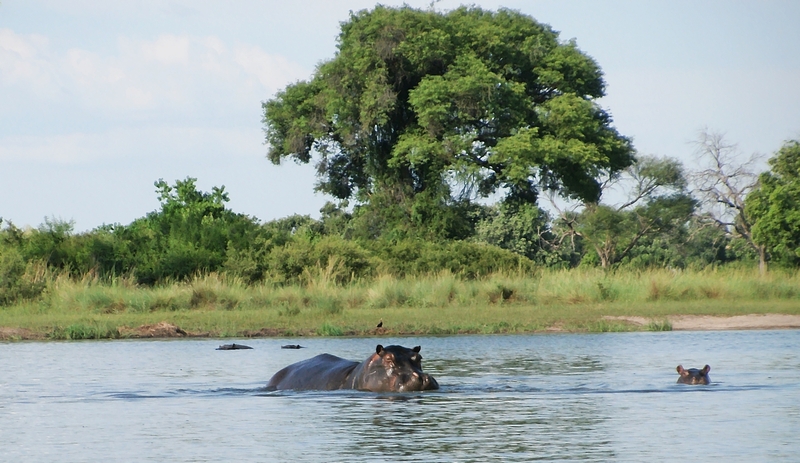 We lavished in the magnificent environment while taking photos and sharing the scenery with birds and hippos sunning in reed-covered Delta waters. It was an unforgettable, idyllic day! After dinner, we retired early and fell asleep to the sweet sounds of African night birds, elephants, and lions. Early the next morning we departed on a game drive viewing more Delta vegetation and a plentiful populations of cheetah, elephant, warthog, buffalo, and wildebeest. 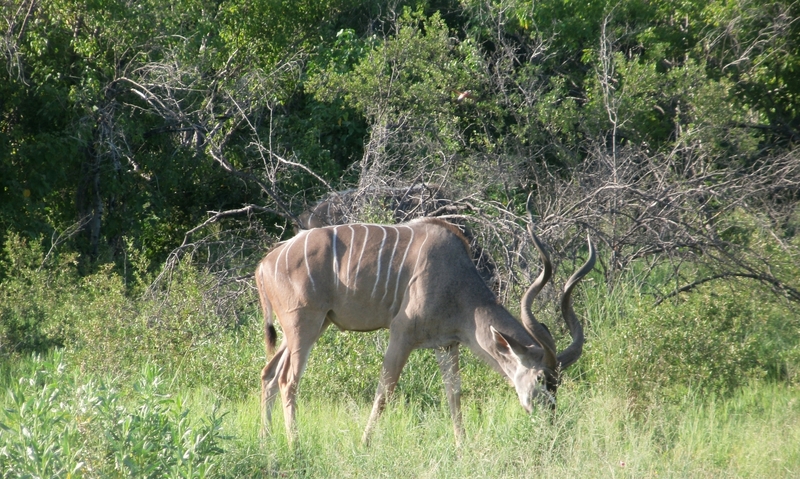 We spotted a Silver-Backed Jackal and many large antelope including Reedbuck, Red Lechwe, Tsessebe, Sable, and my favorite – the beautiful Greater Kudu. Our guides educated us about Delta flora and fauna, insects, and giraffe physique, pointing out some interesting details. Graceful giraffes have long tongues for reaching vegetation, thick saliva to help with digestion, 7 collar bones, and large hearts needed to pump blood up their long necks! 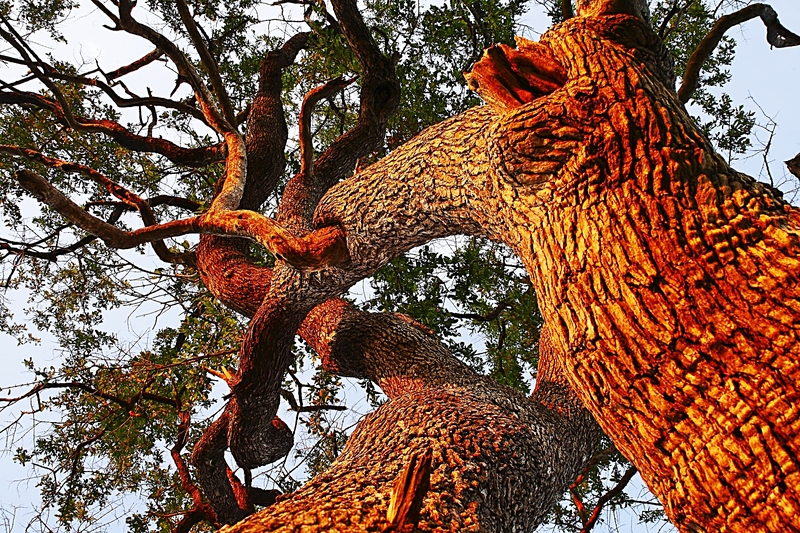 Plants indigenous to the Delta include pungent turpentine grass and exotic trees like Baobab, Camel Thorn, Jackalberry, Leadwood, and the funny-looking Sausage Tree. 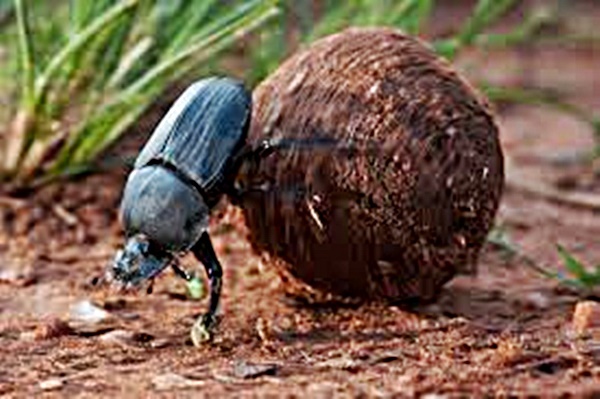 Dung Beetles are one of Africa’s most interesting insects. 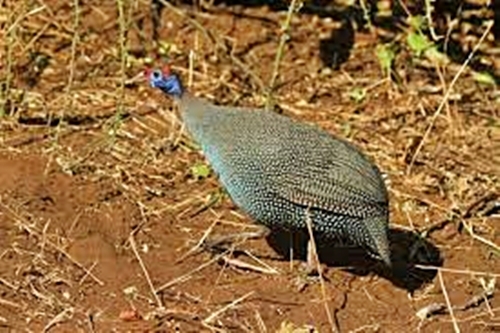 They play an important role in stabilizing the African environment and fighting climate change. That evening at camp we enjoyed a beautiful open-air candlelight dinner under bright stars and a full moon! Despite our best efforts, we finally succumbed to the relentless, nagging insects, moved away from the dining table, and spent the rest of the evening dancing and singing close to an insect-repelling campfire. The next morning it was sad saying goodbye to our kind, gracious African hosts. I wished we had more time there… During a leisurely drive to the airstrip we said farewell to the Okavango Delta and boarded small airplanes for the flight back to Maun. After landing in Maun we made our way through the airport to our waiting guides. Their long faces alerted us that something was wrong. We listened carefully as they told us that vandals had burglarized the safari truck and stolen our personal belongings. In the middle of the night thieves tossed a heavy metal garbage can through a truck window, cut locks off storage lockers, and stole our stuff! While the burglary occurred, our guides were fast asleep in nearby lodges. The burglars stole laptop and tablet computers, cell phones, camera equipment, cash, clothes, food, drinks, and anything left in the truck. The guides alerted the Maun Police after discovering the burglary. The police advised them not to enter the truck, touch, or tamper with potential evidence until they arrived to investigate and take fingerprints. Six hours later, the police still had not appeared! After waiting for hours we disregarded police orders, got into the truck, checked our lockers, and drove to the Maun Police Station. Many safari members lost everything including electronics, clothing, and gear. Surprisingly, the burglars did not bother unlocked compartments, and my duffel bag and its contents were intact and unharmed! When we arrived at the police station the guides accompanied those with loses inside to file reports. After about an hour they came out with a policeman who dusted the lockers for fingerprints. The Maun Police’s casual attitude and lack of concern over the burglary was disturbing. My conclusion – Botswana is not a good place to have an emergency! The theft looked like an “inside job” with employees at the campground / lodge tipping off burglars of our absence. It would have been difficult for outsiders to invade the fenced park with security guards posted at the entrance and throughout the grounds. Those who sustained losses spoke with safari company representatives in Cape Town. Some losses included hard-to-replace items like photo memory cards, jewelry, and favorite gear. Surprisingly, they would not receive compensation from the company’s insurance. Even more surprising, the truck was not equipped with a burglar alarm! A few hours later, the police returned bringing stolen and discarded items they found in the bush near the lodge. Of course electronics and cash were never recovered. 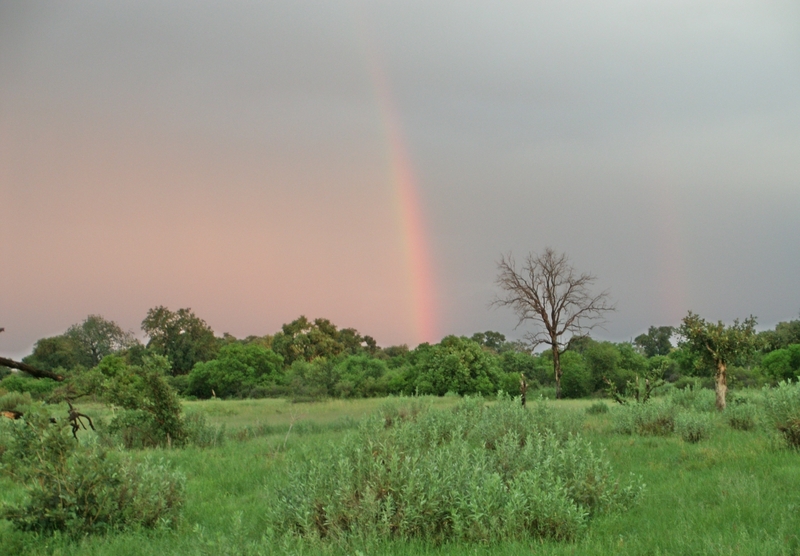 It was a depressing, sour note after our beautiful relaxing experience in the Okavango Delta. In the middle of the night thieves tossed a heavy metal garbage can through a truck window, cut locks off storage lockers, and stole our stuff! The guides managed to get the broken window repaired, and we continued to Botswana’s Nata Bird Sanctuary and Makgadikgadi Salt Pans stopping along the way so people could replace essential items like toiletries and clothing. We would soon discover that our Botswana woes had not ended with the disarming Maun burglary! We spent the night at a lodge in an isolated area near Botswana’s saltpans. 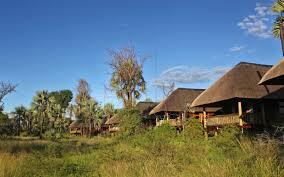 In the middle of the night a fire broke out in the grass thatched roof of one of the lodge buildings. We were rousted from our beds and evacuated to a safe area nearby. The grass thatched roof over the kitchen burst into roaring flames – a wild, vivid, unforgettable orangeish-red image against the ebony African sky! As the flames grew higher the lodge owner feared the fire might spread to other buildings – all with thatched grass roofs. Fortunately it did not. The fire department arrived the next day – after the building had burned completely to the ground! The cause of the fire was not determined, but it seemed suspicious. One possibility was a thunderstorm with lightning that occurred earlier in the night. I heard someone in the crowd say the kitchen was known to have electrical problems…. Shaken but unscathed, the next morning we pulled together and made our way to the town of Kasane and Chobe National Park for a much-needed day relaxing on the Chobe River. The day began very hot but as evening approached, it grew cool and moist on the river. 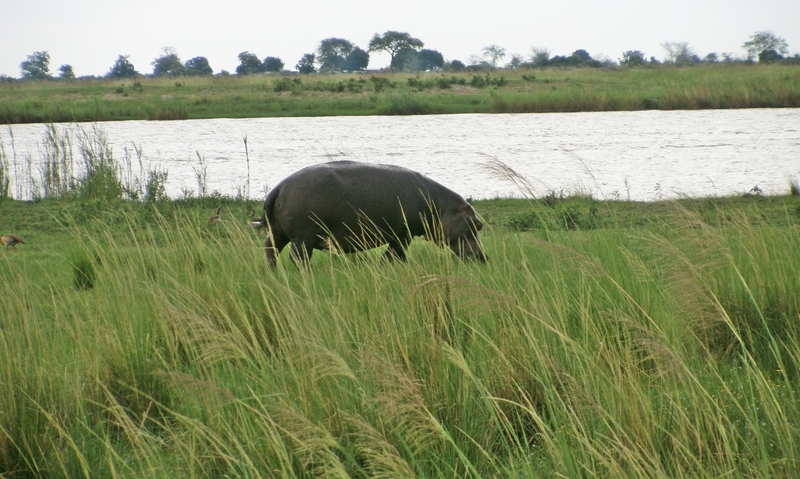 Chobe riverbanks have abundant game, and the region is known for enormous buffalo and elephant herds. During dry season Chobe elephants migrate and travel hundreds of miles from the Chobe and Linyanti Rivers in the north to Botswana’s saltpans in the southeast. Kalahari elephants are known to have frail ivory and short tusks, possibly due to the lack of calcium in the desert soil. This entry was posted in Africa, Botswana and tagged African Fish Eagle, African Wild Dog, Bakgalagadi, Baobab Tree, Batawana, Blacksmith Plover, Botswana, Botswana African Polers, Botswana Diamond Mines, Botswana Drought, Botswana Police Service, Botswana's Independence from Britain, Botswana's Saltpans, Bush Baby, Camel Thorn, Carmine Bee Eater, Chobe National Park, Chobe River, Chobe Riverboats, Dung Beetle, Fallen Baobab, Floodplains, Ghanzi, Giraffe Physique, Greater Kudu, Hammer Kop, Herero, High Income and Low Impact Tourism, Jackal Berry, Jwaneng Diamond Mine, Kalahari, Kalahari Elephants, Kimberlite Pipe, Kudu, Kwando River, Leadwood, Linyanti River, Magma, Makgadikgadi Lake, Makgadikgadi Pans, Maun, Mekoro, Mekoros, Mongoose, Ncoakhoe, Okavango Delta, Okavango Delta Migration, Red Lechwe, Reedbuck, Sable, San, San Bushmen, San Cave Paintings, San People, Sausage Tree, Silver-Backed Jakal, Tectonic Activity, Tsessebe, Turpentine Grass, Umbrella Thorn Tree Acacia Tortilis Mombo by suemtravels. Bookmark the permalink. Oh my Lord. What an adventure. One moment I was thinking, what fabulous photos! Next I was thinking, oh,oh, this sounds a bit odd, and then ! Whew! Well, you had a fabulous experience, and I guess you can cut the perpetrators some slack. They might be imagining that all westerners are rolling in so much money they will never notice the loss of some possessions. Just guessing – but I have had that experience myself in the past. Anyway, no one can rob you of the memory of your amazing tour and all the sights and good encounters you had. And, miraculously, you came through with all in order. Hi Gwen – a Canadian couple in the group lost their tablet and many videos and photos they didn’t have backed up – lots of ways to do that now. The experience ruined the trip for them and their misery ended up affecting everyone. They weren’t booked for the entire Cape Town to Uganda safari of two months (thank goodness) – only me and a guy from Spain. The burglary was creepy and the Maun police even more so :(. After the experience I re- learned that anything you take on safari you must be willing to lose or break. Another couple from Portugal had 600 Euros in their stolen bag – bad move! The burglars must have had a big party on that! It seems naive to leave so much money behind. Or to carry it in the first place, but that may have had to do with access to banks. It would have been a shock to all concerned, and I can understand the downer it would have created, and constant speculation on who and how did it. I try to travel with few valuables. I buy junk jewelry to take for example. Your story is a reminder about backing up photos though!